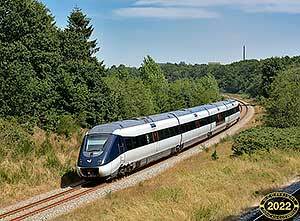 Line 80 runs from east to west across the middle of the Jutland peninsula and is double track but not electrified. Under normal circumstances it only carries DMUs but for two brief periods in the summers of 2014 and 2015 there were big diesels on diverted freights a well. My two visits were when the diversions were running. Line 82 is normally a quiet backwater linking Bramming, just east of Esbjerg, with Tønder, just north of the German border. 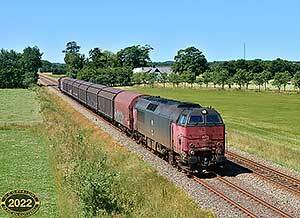 It's normally DMU only but for two brief periods in the summers of 2014 and 2015 there were big diesels on diverted freights a well. My two visits were when the diversions were running. 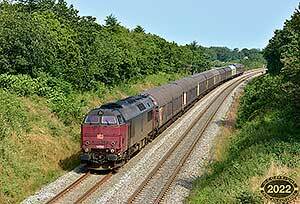 The MZs were the standard Danish main line diesels of the 1970s and 1980s but electrification, privatisation and the headlong rush to run all passenger trains with DMUs have drastically reduced their numbers. 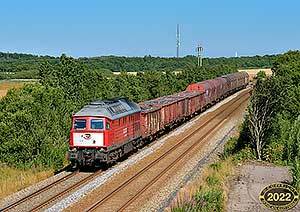 DB still have six and these were used on diverted freights between Fredericia and Esbjerg in 2014 and 2015. The reunification of Germany brought several hundred of these Soviet built Co-Cos to DB and they proved very useful in freight service with quite a few remaining in service 25 years later. These locos aren't normally regular visitors to Denmark but were used on diverted freights between the Hamburg area and Esbjerg in 2014 and 2015. 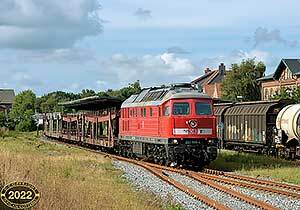 Passenger trains on the Jutland peninsula are normally all DMUs but occasionally something more interesting appears on a special working. 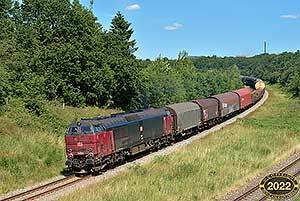 Freight trains are fairly uncommon on the Fredericia - Esbjerg and Bramming - Tønder lines but both lines were used as a diversionary route for a few weeks in 2014 and again in 2015 during major civil engineering work on their normal route..